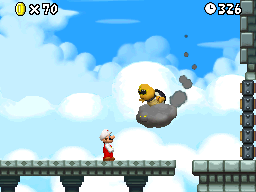 World 7- Castle is the castle level and final level of World 7 in New Super Mario Bros. It can be accessed through a secret exit in World 7-4, or normally through World 7-A or World 7-7. This level uses Snake Blocks extensively, and is the first level in the game to do so. While riding the Snake Blocks, the player must dodge enemies and obstacles such as Amps, spikes, and Thwomps, while also not falling off of the blocks. In the first half of the level, the Snake Blocks maneuver around two Amps; the player must jump over them to avoid taking damage. Next, the blocks will move into a spiked corridor containing Thwomps. In order to avoid the Thwomps, the player must either bait them into falling down early, or quickly run underneath them. After this, the blocks collide with stable ground and collapse, and the checkpoint for the level is reached. There is a ? Block containing a Fire Flower located here as well. In the second half of the level, more Snake Blocks appear. Here, Ball 'N' Chains are introduced, and the blocks will loop around them, meaning the player will need to be very careful to dodge them. Afterwards, the blocks will lead into an area containing Burners, so the player will either need to precisely time their jumps or stall at the right times in order to avoid taking damage or falling. At the end of the level, the blocks collapse on their own in front of the boss door; the player will have to jump or else they will fall straight into a pit. Behind the boss door, the player is taken outside of the castle, in open-air. After making their way up, they can head left to find a Hidden Block containing a Fire Flower. Heading right will take them to the boss arena, where Lakithunder appears. After jumping on him three times, he will be defeated, and World 8 will become accessible to the player. Star Coin 1: In the first half of the level, near the beginning; the player must jump towards it while the Snake Blocks are turning away from it. Star Coin 2: Shortly after the checkpoint; it is on top of a block that a Ball 'N' Chain rotates on. Star Coin 3: At the very end of the level; as the blocks are collapsing, the player must continue standing on top of them and make a risky jump to collect the coin and make it onto the ground.